I just finished reading Creativity, Inc., by far the best book I've read on developing a culture of creativity within an organization. Written by Ed Catmull, co-founder and president of Pixar Animation and eventually Disney Animation, it takes us through the earliest days of Pixar, and most importantly, into the actual creation process of some of the most creative films Pixar ever made, including Toy Story, Wall-E, Up, Monsters, Inc. and more. Ed dispels our romantic notions of what creativity is all about and instead replaces it with actionable insights on how any organization, with incredible dedication to culture and process, can create a far more creative organization. I wanted to share 5 key take-aways I had from Creativity, Inc., illustrated through quotes directly from the book. Many of us have a romantic idea about how creativity happens: A lone visionary conceives of a film or a product in a flash of insight. Then that visionary leads a team of people through hardship to finally deliver on that great promise. The truth is, this isn't my experience at all. I've known many people I consider to be creative geniuses, and not just at Pixar and Disney, yet I can't remember a single one who could articulate exactly what this vision was that they were striving for when they started. In my experience, creative people discover and realize their visions over time and through dedicated, protracted struggle. In that way, creativity is more like a marathon than a sprint. You have to pace yourself. Too many of us think of ideas as being singular, as if they float in the ether, fully formed and independent of the people who wrestle with them. Ideas, though, are not singular. They are forged through tens of thousands of decisions, often made by dozens of people. To reiterate, it is the focus on people - their work habits, their talents, their values - that is absolutely central to any creative venture. Failure isn't a necessary evil. In fact, it isn't evil at all. It is a necessary consequence of doing something new. "If I start on a film and right away know the structure - where it's going, the plot - I don't trust it," Pete says. "I feel like the only reason we're able to find some of these unique ideas, characters, and story twists is through discovery. And, by definition, "discovery" means you don't know the answer when you start. This is key: When experimentation is seen as necessary and productive, not as a frustrating waste of time, people will enjoy their work - even when it is confounding them. There are two key differences, as I see it. The ﬁrst is that the Braintrust is made up of people with a deep understanding of storytelling, who usually have been through the process themselves. While the directors welcome critiques from many sources, they particularly prize feedback from fellow storytellers. The second difference is that the Braintrust has no authority. The director does not have to follow any of the speciﬁc suggestions. After a Braintrust meeting, it is up to him or her to ﬁgure out how to address the feedback. Giving the Braintrust no power to mandate solutions affects the dynamics of the group in ways I believe are essential. Frank talk, spirited debate, laughter, and love. If I could distill a Braintrust meeting down to its most essential ingredients, those four things would surely be among them. The ﬁlm—not the ﬁlmmaker—is under the microscope. This principle eludes most people, but it is critical: You are not your idea, and if you identify too closely with your ideas, you will take offense when challenged. Research trips challenge our perceived notions and keep cliches at bay. They fuel inspiration. They are, I believe, what keeps us creating rather than copying. Here's a curious thing about research: The authenticity it fosters in the film always comes through, even if moviegoers know nothing about the reality the film is depicting. Very few moviegoers have actually been inside the kitchen of a high-end French restaurant, for example, so you might think the obsessive specificity of Ratatouille's kitchen scenes - the chefs' clogs clacking on the black-and-white tile floors, the way they hold their arms when they cut up vegetables, or how they organize their work spaces - would be lost on the audience. But what we've found is that when we are accurate, the audiences can tell. It just feels right. Does this kind of microdetail matter? I believe it does. There's something about knowing your subject and your setting inside and out - a confidence - that seeps into every frame of your film. The takeaway here is worth repeating: Getting the team right is the necessary precursor to getting the ideas right. It is easy to say you want talented people, and you do, but the way those people interact with one another is the real key. Even the smartest people can form an ineffective team if they are mismatched. That means it is better to focus on how a team is performing, not on the talents of the individuals within it. A good team is made up of people who complement each other. There is an important principle here that may seem obvious, yet - in my experience - is not obvious at all. Getting the right people and the right chemistry is more important than getting the right idea. I could speak at length to the lessons I gleaned from Creativity, Inc., but I couldn't do so as eloquently as Ed Catmull did himself. 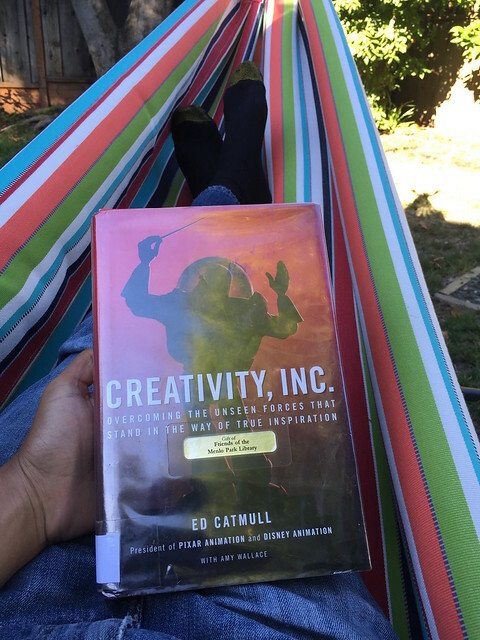 So I encourage you to take the time to read it for yourself if boosting your organization's creativity is important to you: Creativity, Inc by Ed Catmull.